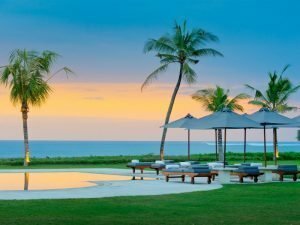 Where to practice yoga while on a villa holiday in Sri Lanka? Sri Lanka has a wide range of beautiful villas with different amenities and located in varied areas of the island. 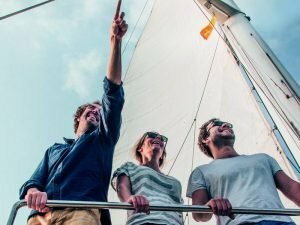 You can have Villas in Sri Lanka that are suitable for families, as they have tailor-made services (such as nanny services) or special rooms for kids and other amenities (bunk beds, toys, games, TV rooms), or that are located in front of quiet and safe beaches. Other villas are great for surfers, because they are strategically located near great surfing spots and near beaches that offer specific services for surfers, such as surfing classes or surfing board rental. Sri Lanka has recently experienced an important increase in Yoga-friendly accommodation, providing professional and certified Sri Lankan Yoga teachers, as well as internationally-recognised Yoga instructors. 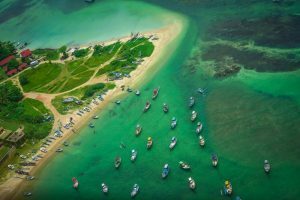 The South Coast, as well as the Central Provinces of Sri Lanka have also special centres organising Yoga Retreats where they specialise in Yoga teacher training courses in Sri Lanka. 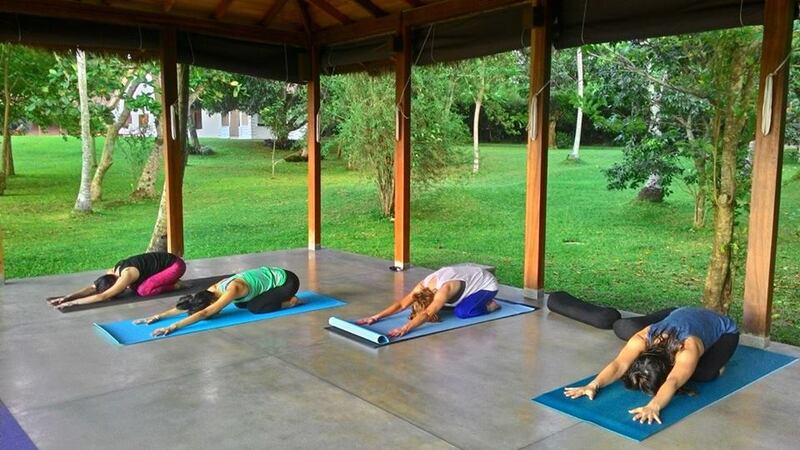 Whether you wish to practice traditional Hatha Yoga, Iyengar Yoga, Kundalini Yoga, Ashtanga Yoga or many more, you will be able to find suitable instructors and facilities all around the island. 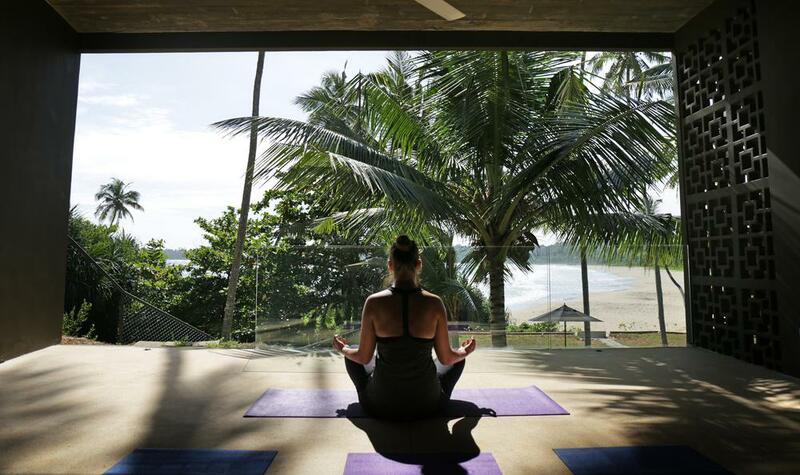 What if you prefer to enjoy a private Villa holiday with a Yoga experience included in your stay? In this post we are recommending a list of best yoga villas in Sri Lanka. What do we mean with Yoga Villas? Our selection of best yoga villas in Sri Lanka includes those villas that can provide professional instructors, Villas that allow or organise themselves yoga retreats and that have a dedicated area and Yoga Shala where you can practice your Yoga, while you are holidaying in a Sri Lankan Villa. Villa 16 in Talalla Beach. A five-bedroom Villa with a stunning view of Talalla Beach. Number of Rooms: 6 doubles + 1 twin. Yoga Shala size: 258” x 240” (6.5×6.5 metres). This contemporary beachfront Villa is located in one of the most beautiful beaches in the Southern Coast, according to our personal choice. The villa has a special 258″x 240″ (6.5 x 6 mts) Yoga Studio, where to practice yoga and can provide special Yoga lessons while you stay in Sri Lanka. 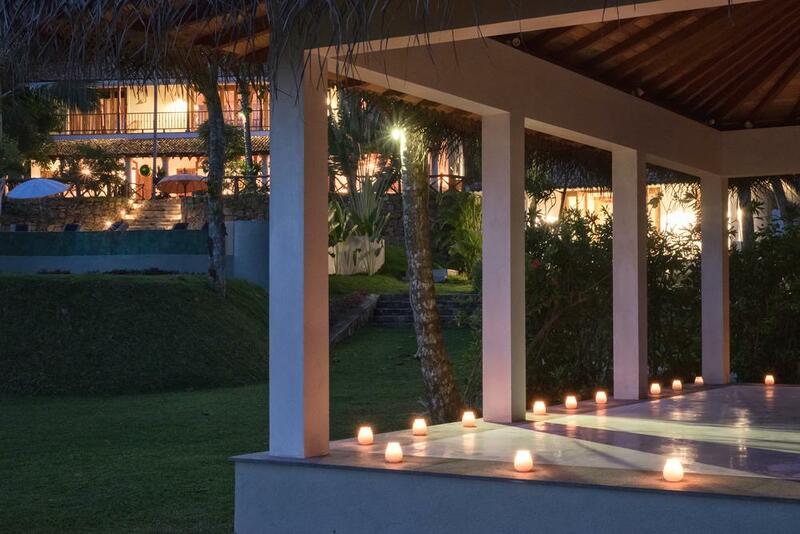 If you wish to combine the Villa holiday with a Yoga Teacher Training program, this is a great choice, as it is conveniently located near a local resort that provides this program to local and international yoga practitioners. Number of Rooms: 5 doubles, 2 twins. Sleeps: up to 17 guests with extra beds in rooms. Yoga Shala size: 652 sq feet (60 square metres). Manages comfortably 13 students, including the teacher. This stunning 7-bedroom Villa in Sri Lanka is located only a 15 minute drive to the beaches of Galle and Unawatuna and it is the ideal place for a Yoga retreat in Sri Lanka. Conveniently located few kilometres from the Southern Beaches of Sri Lanka, the villa is set in a lush tropical garden, surrounded by wildlife and tranquillity. A perfect location for a Yoga Retreat in Sri Lanka. This Dutch-style colonial Villa has been also recommended by Travel magazines such as Conde Nast Traveller and Harper’s Bazaar and provides a unique and luxurious home from home experience. The villa is fully staffed, with a chef on hand and a warm service from the villa’s staff. A luxury 5-bedroom Villa near Tangalle, designed by renowned architect Geoffrey Bawa. Number of Rooms: 2 doubles, 2 twins, 1 triple. Yoga Shala size: 300″x 228″ (7.62 x 5.8 metres). This Villa is a luxury five-bedroom villa near Tangalle, located in a privileged spot, a hill overlooking the Indian Ocean. 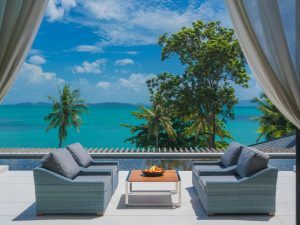 The Villa provides Yoga classes on request and a special 300″x 228″ (7.62 x 5.8 mts) yoga pavilion perches on the top of the hill with inspiring easterly views across the garden and out to sea. Overlooking the bay at the bottom of the garden, the pool terrace floats amongst the rocks. 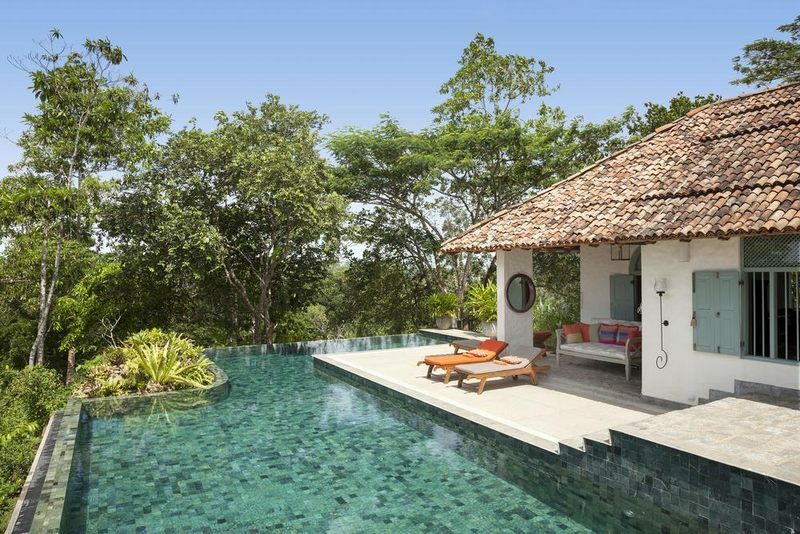 What underpins this villa and makes it an absolute pleasure, is the intelligence with which Geoffrey Bawa designed it. The natural airflow that glides up the hill and through the open face, refreshes every corner and keeps the space cool, making it an ideal place for open-air Yoga practices. Number of Rooms: 1 Family Suite, 3 Doubles, 1 Twin, 6 Bunk beds. This seven-bedroom Villa is one of our favourites and has a great pool with a 20-meter water slide that falls into a plunge pool, making it also one of the best family friendly villas in Sri Lanka. Discreetly positioned further down the garden, is a stunning and spacious 336″x 276 (8.5 x 7 mts) Yoga pavilion with wonderful views out to sea. The beautifully landscaped garden ensures this is a gentle and quiet area perfect for yoga and meditation, whilst hammocks swing between the palm trees, down by the beach. An ideal place for large group yoga retreats of up to 20 guests. Number of Rooms: 5 Doubles, 2 Twins, 4 Triples, 1 Quadruple. Yoga Shala size: up to 18 students + a teacher. This villa is a fantastic choice, if you are looking for a 100% yoga retreat Villa holiday in the hill country of Sri Lanka. The Villa features a stunning Yoga Shala that can comfortably accommodate 18 students plus a teacher and provides all accessories and props for any Yoga practice. The Shala has been built with mature teak from a nearby estate to give a warm, natural feel and the structure stands against a natural rock wall. Open on all sides, and with a nice high ceiling, the place gives a great feeling of space. The Villa also organises yoga retreats with local and international teachers and has a specialised vegetarian and vegan menu. It is conveniently located near the hill country capital of Kandy and beautiful trekking excursions and other outdoor activities can be arranged on request. The Villa also offers short 3 days special packages with food, accommodation and yoga included. A luxury inland Villa with 6 bedrooms and a dedicated Yoga shala. Number of Rooms: 6 Doubles. Travelling up to this remarkable house and beautifully manicured 8-acre tea estate which also has cinnamon, pepper and fruit groves – the track is bordered by a stunning stone wall dividing the pineapple plants, mango and avocado trees on one side with a carpet of perfectly tended tea on the other. A superb collaboration between the English owners and an acclaimed Sri Lankan architect has evolved to create this truly spectacular tropical paradise. Below the Garden House is the recently appointed Yoga shala with breathtaking views across the jungle canopy to the faraway hill on the horizon. The Yoga shala measures 240″ x 144″ (approximately 6 x 3.7 metres); the Villa provides also Yoga Mats. A truly luxury Yoga experience in Sri Lanka. A peaceful inland Villa, with dedicated Yoga packages and retreats. Number of Rooms: 5 Doubles. This lovely inland Villa near Tangalle features five bedrooms and is one of the first Villas that started to provide Yoga Retreats with internationally-recognised instructors. 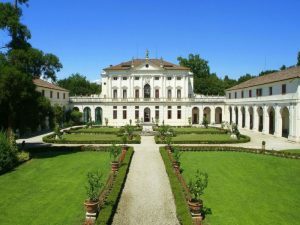 The supremely peaceful setting of this selected Villa is perfect for those who seek calm and serenity. Classes take place at sunrise and sunset. The Villa offers Internationally trained Iyengar Yoga & Tai Chi teachers, with over 30 years’ experience, Tailor-made yoga retreats, for short or longer stays, a stunning and spacious Yoga Shala for yoga and meditation, a customised menu as well as mats for students. 100 metres away to the closest beach. Yoga Shala size: up to 8 people comfortably. This beautiful Villa in Weligama has four bedrooms and can accommodate up to 9 adults. One additional Z-bed for child is available on request. All double beds are 4 poster and have mosquito nets. The Villa is located a two-minute stroll to the closest beach and has a very homely feeling. The Villa has a list of great local yoga teachers who can come to the villa and take you through a class, whether you want to really work out or just practice some gentle stretches. The yoga shala can accommodate up to 8 adults comfortably. Located 10 minutes from Unawatuna Beach in a tranquil rural setting. Yoga Shala size: 14 x 21 ft (approximately 4.3 x 6.40 metres). This lovely inland Villa is a peaceful four bedroom retreat with a yoga shala and swimming pool, set in a rural area and surrounded by well cultivated paddy fields. 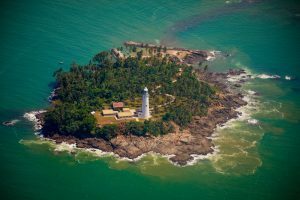 It is located a 10-minutes drive to Unawatuna beach and to the UNESCO Galle Fort. 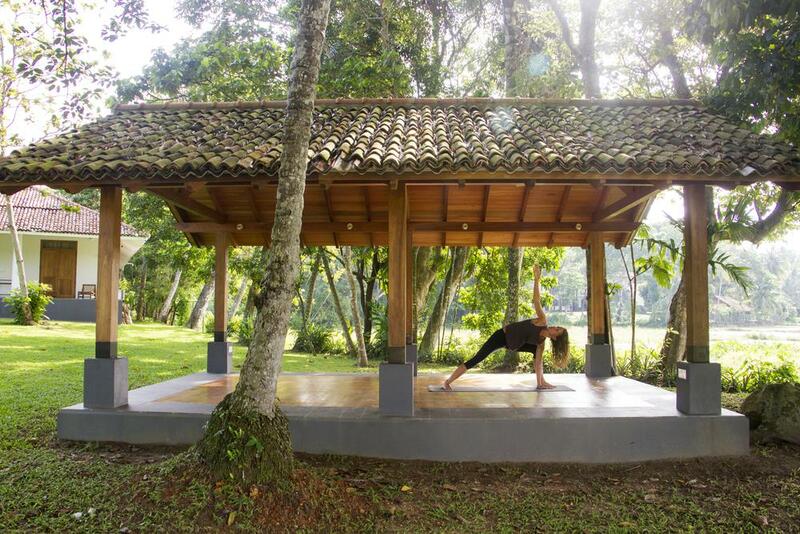 Ideal for a quiet Yoga Retreat for small groups, due to its tranquil location and surrounded by nature. If you are looking to organise a Yoga Retreat in a Sri Lankan Villa or to book a Villa with yoga facilities for your family and friends, contact us and we will give you the best Villa options for your group and your budget.